LOOKING TO MAKE A LAST-MINUTE ADDITION TO YOUR HOLIDAY PARTY THAT WILL BLOW AWAY YOUR GUESTS? BOCA RATON MAGICIAN ROBER, SPECIALIZES IN TURNING EVENTS INTO CELEBRATIONS. CALL NOW TO HAVE A WORLD-CLASS MAGICAL ENTERTAINER DELIGHT ALL OF YOUR GUESTS WITH FUN, INTERACTIVE MAGIC THAT'S PERFECT FOR YOUR NEXT EVENT OR FUNCTION. PRIVATE PARTY – IF YOU ARE HAVING GUESTS AT YOUR HOME, YOU WANT CASUAL, NON-INTRUSIVE ENTERTAINMENT THAT EVERY GUEST WILL LOVE. NO MATTER THEIR AGE OR INTERESTS, EVERYONE LOVES WATCHING MAGIC, EVEN MORE SO WHEN THEY GET TO EXPERIENCE IT IN FRONT OF THEIR EYES AND IN THEIR VERY OWN HANDS. A CLOSE-UP MAGICIAN IS A PERFECT WAY TO ENERGIZE THE ATMOSPHERE OF YOUR PARTY AND INVOLVE ALL OF YOUR GUESTS. ENTERTAINMENT MAY BE THE MOST IMPORTANT ASSET FOR YOUR PRIVATE PARTY. THE FOOD AND DRINKS WILL EVENTUALLY BE FORGOTTEN, BUT ROBER CAN HELP MAKE YOUR NEXT EVENT AN OCCASION THAT PEOPLE WILL REMEMBER LONG AFTER IT IS DONE. ROBER HAS ENTERTAINED AT PRIVATE PARTIES RANGING FROM COCKTAIL RECEPTIONS TO PENTHOUSE SUITES AND CAN PERFORM INTIMATE, CLOSE-UP MAGIC USING BORROWED OBJECTS FROM YOUR GUESTS. ROBER'S FLOOR SHOW WILL WORK FOR BOTH SMALL AND LARGE CROWDS, AND ROBER CAN SET EVERYTHING UP IN YOUR OWN HOME (INCLUDING MICROPHONE AND SOUND SYSTEM). YOU WILL BE GETTING THE SAME ENTERTAINMENT THAT ROBER PERFORMS INTERNATIONALLY FOR CRUISE LINES AND CORPORATE EVENTS. ROBER WILL NOT DE-MEAN OR EMBARRASS YOUR GUESTS, AND COMBINES MAGIC WITH COMEDY, MENTALISM, AND SLEIGHT-OF-HAND TO CREATE A PERFORMANCE THAT YOUR GUESTS WILL TALK ABOUT FOR YEARS TO COME. THIS HOLIDAY SEASON IF YOU ARE HAVING A PARTY IN THE SOUTH FLORIDA AREA, CONTACT US NOW TO RESERVE YOUR DATE BY SUBMITTING OUR CONTACT FORM OR BY CALLING US DIRECT AT 1- . COMPANY EVENT – ARE YOU HAVING A HOLIDAY BUSINESS PARTY, FUNCTION, OR HOLIDAY CELEBRATION FOR YOUR COMPANY EMPLOYEES? HIRE THE BEST MAGICIAN IN SOUTH FLORIDA AND MAKE THIS YEAR'S PARTY THE ONE THAT ALL OF YOUR GUESTS WILL TALK ABOUT! YOU'VE PROBABLY BOOKED A VENUE FOR THIS YEAR'S PARTY. YOU'VE GOT THE FOOD, THE MUSIC, AND THE GUEST LIST. NOW ADD THAT FINAL TOUCH OF CLASS, WARMTH, AND ENERGY BY INVITING ROBER TO ENTERTAIN YOUR ENTIRE STAFF. ROBER'S INTERACTIVE, AUDIENCE TESTED PERFORMANCE WILL BE A HIT AT YOUR NEXT EVENT. THE 30 – 45 MINUTE SHOW COMBINES MAGIC, COMEDY, SLEIGHT-OF-HAND, AND MIND READING – SOMETHING FOR EVERYBODY. ROBER CAN TAILOR HIS ROUTINES SPECIFICALLY FOR YOU AND YOUR ORGANIZATION, AND CAN INCORPORATE ROUTINES WRITTEN SPECIFICALLY FOR YOUR EVENT (INCLUDING MAKING YOUR CEO OR PRESIDENT MAGICALLY APPEAR). THE PERFORMANCE TYPICALLY STARTS WITH CLOSE-UP, SLEIGHT OF HAND MAGIC DURING YOUR COCKTAIL OR SOCIAL HOUR. YOUR GUESTS WILL ENJOY MAGIC WITH CARDS, COINS, AND OBJECTS BORROWED FROM THEM. THIS ACCOMPLISHES A FEW THINGS. FIRST, IT ALLOWS ROBER TO MEET YOUR GUESTS AND LEARN THEIR NAMES. SECONDLY, IT GIVES YOUR GUESTS A COMMON GROUND TO DISCUSS WHAT THEY JUST WITNESSED, HELPING TO FOSTER INTRODUCTIONS BETWEEN ATTENDEES. FINALLY, IT ALLOWS ROBER TO PLAN WHO WILL WORK BEST FOR VARIOUS SEGMENTS IN THE FLOOR SHOW. THIS IS ROAD TESTED OVER HUNDREDS OF SHOWS WHERE I'M ONLY DOING THE MATERIAL THAT KILLS 'EM EVERY TIME. AND FRANKLY, YOU KNOW SOMEONE FROM YOUR GROUP YOU'D LIKE TO SEE SAWN IN HALF! THAT'S WHAT MAKES THE SHOW. YOUR PEOPLE PUT INTO HILARIOUS SITUATIONS! THIS IS A GUARANTEED HIT AT YOUR EVENT EVERY TIME. EVERY SINGLE TIME! 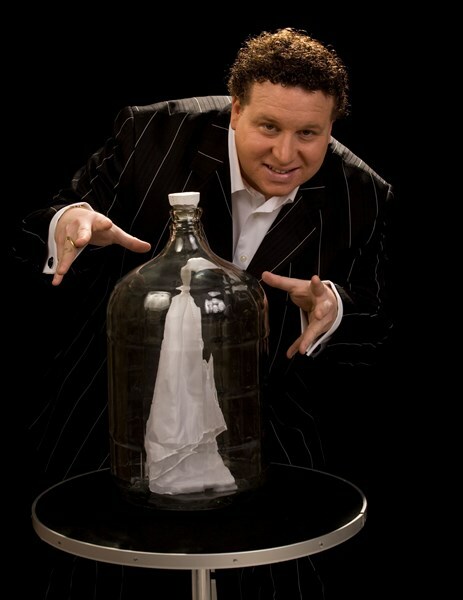 CORPORATE MAGICIAN ROBER OFFERS MAGICAL ENTERTAINMENT FOR SALES MEETINGS, TRADE SHOWS, PRODUCT LAUNCHES, AND HOSPITALITY SUITES. WHETHER YOU NEED CLOSE-UP OR STAGE MAGIC, OR TO MAGICALLY PRODUCE THE CEO, ROBER CAN PROVIDE THE SERVICES YOU NEED. 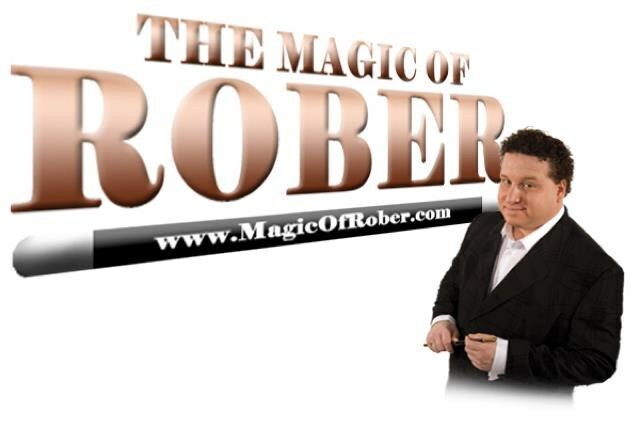 ROBER'S SHOW COMBINES MAGIC, MENTALISM, COMEDY, AND ILLUSION IN A 30 TO 45 MINUTE PERFORMANCE. HIS QUICK WIT AND CHARM WILL KEEP YOUR AUDIENCE LAUGHING THROUGHOUT THE EVENING. IF YOU ARE PLANNING AN EVENT FOR YOUR COMPANY, YOU KNOW HOW DAUNTING FINDING THE BEST ENTERTAINMENT CAN BE. BY HIRING THE MAGIC OF ROBER, YOU CAN REST EASY KNOWING THAT YOU HAVE HIRED A DYNAMIC PROFESSIONAL WHO WILL SHOW UP ON TIME AND READY TO PERFORM. MOST IMPORTANTLY, YOUR COMPANY WILL THANK YOU FOR SETTING UP THE PROGRAM. TAKE A SECOND AND FILL OUT THE FORM SO I CAN SEND YOU SOME PRICES. THANKS FOR VISITING AND I HOPE TO SEE YOU SOON! It was a wonderful show! The kids had a fantastic time & I have gotten a lot of positive feedback from parents & teachers that attended the event! 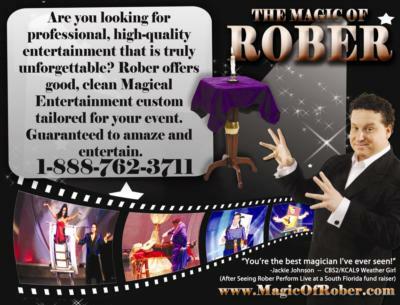 I would highly recommend the Magic of Rober! My daugther and her friends really enjoyed the show. Rober was amazing! Thanks so much for the great time! Rober was absolutely fabulous. My guests were dazzled and had an amazing time. He was the star of the party. Excellent performance. Our guests were impressed by his talent. A number of them asked: where did you find him? Online at GigMasters we replied. We definately recommend Rober to anyone seeking a professional magician. Magic of Rober was enjoyed by our residents in our independent living area of our retirement community. He was talented, interacted with the audience and was well received. The residents have already asked to have him back again. Great show, the guests were amazed! Very professional and punctual! We thoroughly enjoyed Rober's magic for our corporate party! Rober arrived early to make sure everything was in order for the show. The guests had a fantastic time because of how professional and entertaining the magic was! We recommend Rober and would re-hire him in a heartbeat. We highly recommend Rober for anyone interested in having a fantastic magician for their party! He was very professional and provided us with an amazing magic show that was as good, if not better than some magic shows we've seen on cruise ships and in Las Vegas! Can't go wrong! What a pleasure it was to have Rober perform for our son's 6th birthday party! Since our son is crazy for magic, we wanted a magician that would do the trick (so to speak!) and entertain him as well as all his friends and our family. Rober certainly was much more than we had expected! From his impressive backdrop that he set up in our living room to make it look like a theater, to his highly entertaining magic show! He actually pulled a real rabbit out of an empty hat! You always hear about magicians doing that trick, but you never actually see it happen! Anyway, we can't recommend Rober enough! Everyone is still talking about how great the magic show was! Please note Magic Of Rober will also travel to Delray Beach, Deerfield Beach, Boynton Beach, Pompano Beach, Lighthouse Point, Parkland, Coconut Creek, Lantana, Lake Worth, Coral Springs, North Lauderdale, Greenacres City, Fort Lauderdale, West Palm Beach, Palm Beach, Royal Palm Beach, Dania, Riviera Beach, Hollywood, Loxahatchee, Lake Park, Pembroke Pines, Hallandale, North Palm Beach, Miramar, Palm Beach Gardens, Miami, Opa Locka, Miami Gardens, Jupiter.